We are told that all this naughtiness happened under previous systems and people, and that it has already changed, and the bad old culture has been cleaned up. We are told there is no need to keep a close eye on them, no need to investigate them further. Just leave them alone and trust them, we are told. One of these 'bad things' that we are supposed not to worry about anymore has been excessive pay in the banking sector. The Parliamentary Commission on Banking Standards released its report in June 2013, including a couple of graphs on banker pay. One of these exposes that far from 'excessive pay' being brought under control, it is now even higher than it was in the fat days before the 2008 crash. Banks (other than Barclays, that avoided taking a British government bailout by taking an Arab government bailout) have been able to claim their total wage bills have remained relatively stable since 2007. "While aggregate remuneration across the sector has remained relatively stable, staff numbers have fallen, meaning that per-capita remuneration has actually increased over recent years." "The discrepancy between the much-vaunted falls in bonuses and the reality of static or rising total and per-capita remuneration is in part due to a shift from variable to fixed pay. For example, at Barclays, the Salz Review found that: fixed pay as a proportion of total compensation has changed significantly, increasing on average from 65 per cent in 2010 to 76 per cent in 2012 across the Group. This shift has been even more pronounced in the investment bank where average fixed pay has risen from 25 per cent in 2007 to 59 per cent in 2012, and from 6 per cent in 2007 to 32 per cent in 2012 for managing directors only, reflecting both absolute increases in fixed pay and significant reductions in average bonus." Remember, banks boast that they should be allowed a free rein to play fast and loose with clients, investors, and taxpayers because they employ lots of people in the UK. And yet their solution to control excessive pay is to sack lots of people and pay the elite even more excessively! And remember, bankers don't do all the reckless stuff and the mis-selling because they are recklessly wicked or stupid, but because they are recklessly greedy. The root of the problem is excessive pay inflaming their greedy recklessness! When will those in a place to do something about this actually do something about this? Why not simply shoot the wankers and any family member who tries to inherit, and be done with em once an for all? Revolutionary talk, Anonymous! I've stopped banking with a Big Bank and joined a Credit Union- my way of protesting. Few bank staff earn high salaries, most are not well paid. A relatively small number get the eye watering bonuses, those who work in speculation not at the branch level. 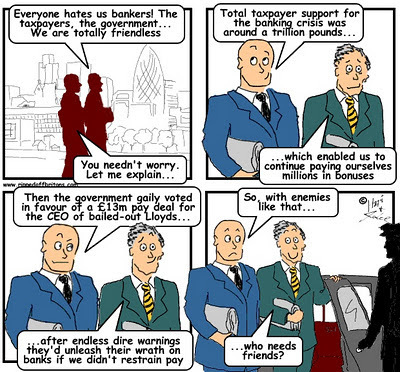 Comments that appear to blame all bankers are inaccurate and irresponsible. agree most ordinary staff are decent. but wasnt it branch level that sold ppi?